In 2006, LaDainian Tomlinson set an NFL record by scoring 28 rushing touchdowns. The next year he had about half of that, only scoring 15. In 2011, Calvin Johnson caught a ridiculous 11 touchdown passes in the first 8 games of the season. In his next 24 regular season games, he caught 10. In 2007 Tom Brady set an NFL record with 50 touchdown passes. In each of the 5 seasons after that, he hasn't broken 40. The point being that it is really hard to continuously play football at an elite level. Sooner or later you’re going to come down to Earth. Last season Calvin Johnson set the single-season receiving record, and Adrian Peterson was 9 yards away from breaking the single-season rushing record. We can’t possibly expect the same performance from them again this year. This is an important question to ask when drafting fantasy football players. Should you avoid players who had unusually high fantasy scores the previous season because they’ll tend to be overrated? To answer that question, I’m going to take the top 3 fantasy football performers at each position for every year since 2006 and compare their fantasy scores in their “top 3 year” to their scores following year. If the difference is significant, I'll then compare their ranks for each year to get an idea of how much they regressed. To compare the two values, I’m going to use Minitab’s paired t test. I have to use a paired t test because I have dependent samples (the values each year are for the same player). If I had independent samples, I would use a 2-sample t test. You can find out more about the difference between the two tests here. We’ll start with the most important position on a football field. 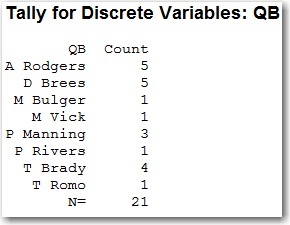 To start, let’s use Minitab’s tally command to see which quarterbacks have the most top 3 finishes since 2006. NOTE: For each position, I’m including the top 3 players from 2012 in the table for tally. But because I don’t know how they will do in 2013, they are not included in any of the calculations for the paired t test. This is a short list dominated by Rodgers, Brees, Manning, and Brady. With so many consistently great quarterbacks on this list, we actually shouldn’t expect much of a drop off the following season. Let’s see if the statistics agree. The difference informs us that on average, quarterbacks score an average of 43.8 fewer points the year after they finish in the top 3 in fantasy scoring. However, the p-value is 0.111, which means we cannot conclude that this difference is statistically different from 0. In other words, we can’t conclude that quarterbacks have a worse fantasy football season the year after they finish in the top 3. And keep in mind these results include Tom Brady in 2007, when he scored all the fantasy football points, and compares it to 2008, when he was injured 8 minutes into the season and finished with 3 fantasy points. Quarterback is usually the least injured position in football (that is, unless you’re Ben Roethlisberger). So if we remove that observation, the difference in fantasy points is cut in half to 22.6, and the p-value increases to 0.18. So in general, you should be confident that elite fantasy football quarterbacks will be able to repeat their performance the next year. Especially if their name is Rodgers, Brees, Brady, or Manning (although make sure it’s Peyton). And considering the top 3 quarterbacks last year were Brees, Brady, and Rodgers, you shouldn’t be worried that you’re drafting an overrated player if you pick them this year. Will elite running backs fare as well as the quarterbacks? To start, let’s get a list of all the top 3 running backs since 2006. The list is much larger than the one for quarterbacks. Unless your name is Peterson or Foster, it look like running backs are unable to be great fantasy players for more than one year. Will the statistics back up this claim? In fact, the statistics do back up this claim. It’s very hard to consistently be an elite fantasy football running back. On average, a top 3 running back scores 79.7 fewer points the following season. And the p-value of 0.000 tells us that this difference is statistically different from 0. The 95% CI informs us that we can be 95% confident that the true decrease in fantasy football points is between 53.6 and 105.8. On average their ranking drops by 8.7 spots (which is statistically significant with a p-value of 0.002). So when a running back finishes in the top 3 one season, it’s not unusual for them to drop out of the top 10 the next. Last year the top 3 running backs were Peterson, Foster, and Martin. Peterson is almost certainly due for a decrease in fantasy points, as it’s unlikely he’ll rush for over 2,000 yards again. However, last year he could have scored 37 fewer points and still been the #1 running back (through week 16). So even with a big drop in points, he could still be a top running back. 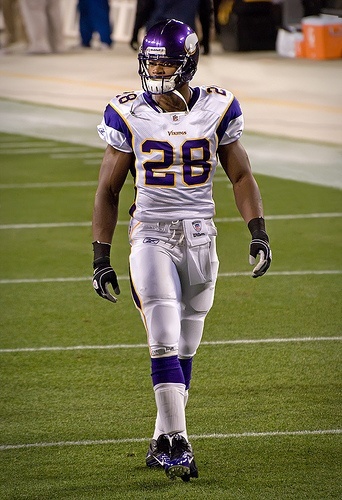 Plus, he has been a top 3 running back for 4 of his 6 years in the NFL (finishing 4th and 6th the other two years). He’s about as safe as they come when it comes to drafting running backs and should be the #1 pick regardless of the fact that he'll most likely decrease in fantasy points. 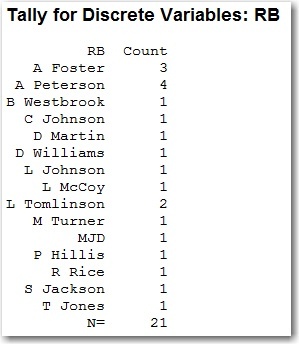 Arian Foster is another running back who bucks the trend shown here. He’s now been a top 3 running back three years in a row. So, like Peterson, I wouldn’t worry about Foster being overrated. And that brings us to Doug Martin. Despite being the third highest-scoring running back, Martin has only scored more than 20 points twice. The reason he finished 3rd overall is that he scored 32 and 51 points respectively in those two games. Outlier games like that are unlikely to happen again and can inflate a players value. Remember how Jahvid Best scored over 40 fantasy poitns in his 2nd game ever, and then was never heard from again? I'm not saying Doug Martin is going to completely disapear from the fantasy football world like Best, but if there is one running back that I’d be worried about drafting too high, it’s Martin. Buyer beware! Don't miss part 2 of this analysis, where I'll look at wide receivers and tight ends! Photo by Mike Morbeck. Licensed under Creative Commons Attribution ShareAlike 2.0.